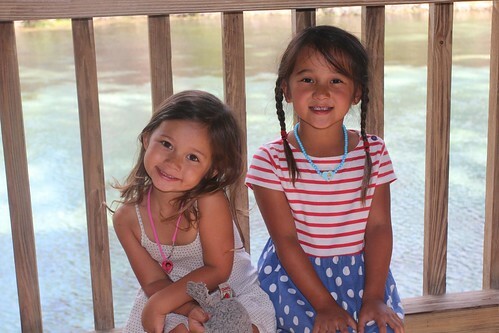 Mali Mish - Day 163: Ava's sixth birthday and a trip to Weeki Wachee. 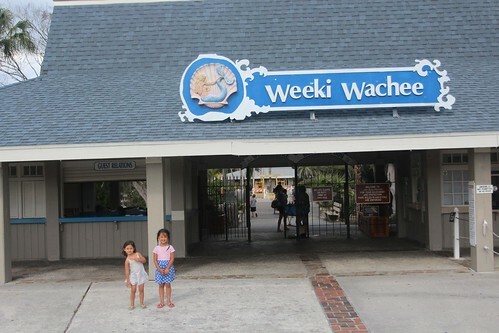 Day 163: Ava’s sixth birthday and a trip to Weeki Wachee. Today you turned SIX! 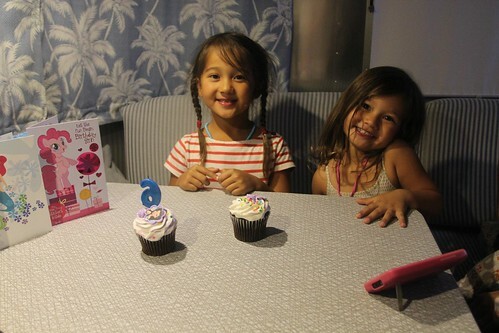 And today was the first time you ever had a birthday in the Airstream. For every one of your birthdays, you knew exactly what type of party you wanted. But this year was different because this year you wanted to be totally surprised. How adventurous of you! 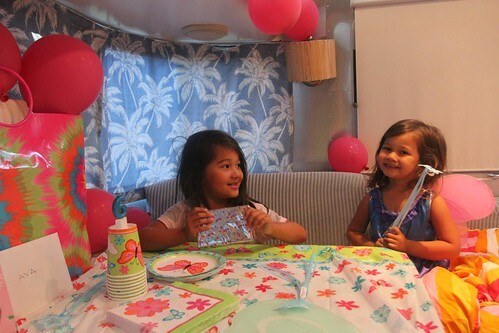 So Mila and I gladly put on our party planning hats and created a butterfly party just for you, complete with wings and with an Airstream full of pink balloons. By some miracle, your little sister didn’t spill the beans and you were completely surprised in the morning when you opened your eyes. You spent the morning opening presents that Mila helped pick out and wrap for you. Your favorite presents were Candyland and a LalaLoopsy coloring book. By the time we were all dressed, your Nona and Dida woke up in California for round two of your present opening via Skype. 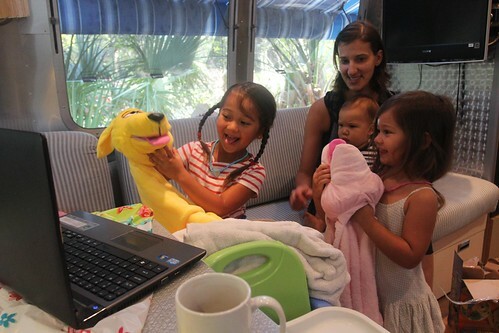 They surprised you with a dog blanket/puppet that you have been begging for… and they thankfully bought one for Mila too. No tears, yeah! Since today was your day, you got to pick any place to go. 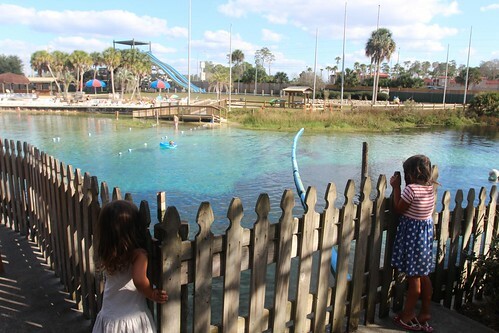 I would say your top three spots to visit are Disney (for obvious reasons), New Orleans (for the beignets, duh) and Weeki Wachee (for the mermaids). 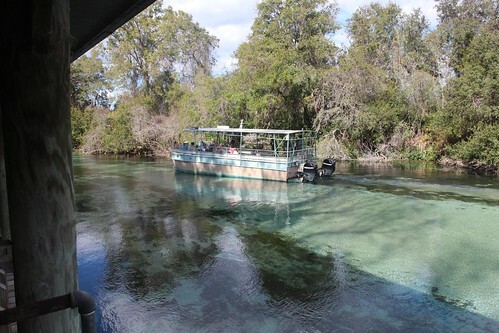 And lucky for you (and us), we were only about 60 miles from one of your favorite places in the whole country, and your choice of the day: Weeki Wachee Springs!! You were only 3 years old on our last cross country trip and many of the stops we made have escaped your memory but for some reason, the day we spent here stuck. So here we are back again. 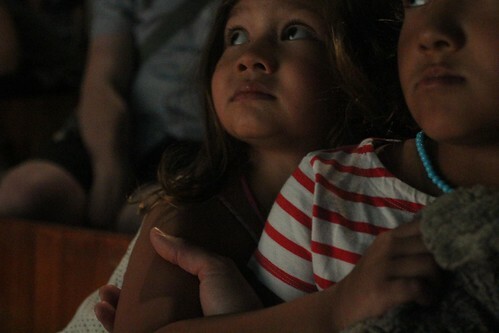 Making new memories that will hopefully once again stick for you and for your little sidekick too. You have been asking us a lot of questions about this place. “Are the mermaids really real”, you ask over and over again. In which your dad and I reply that you will have to see for yourself. 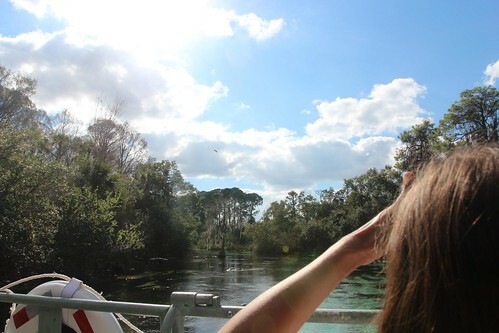 Our first stop at Weeki Wachee is a boat ride down the spring. The water is so crystal clear here and is only two feet in depth. You were excited to be the first one on the boat and to get a front row seat on our little twenty minute cruise down the spring. In the middle of those trees, lay a nest of baby bald eagles. The last time we were here was the very first time I saw one in the wild and was floored by the experience. This time around, you were right there with me, trying your best to get a look at the vigilant mama eagle, too. When your little brother is not napping in the carrier, he is constantly on the look out for you. And when he finally spots you, he has a special shriek just for you, accompanied by a little dance too. On the way to the next attraction, you spot the bay where they also have a water park. You ask why we are not swimming and sliding and we quickly point our fingers at the fish swimming in the water. No future explanation was needed. Hehe. After weeks and weeks of anticipation, the main event was finally here. Mermaid time!! 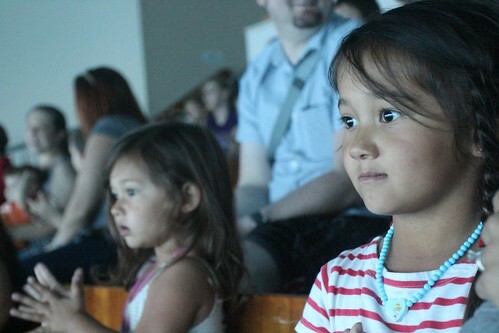 We showed up to the show early to get the best seat in the house for the Little Mermaid show. 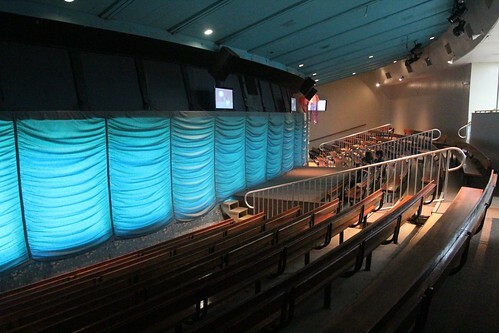 As we sat down in the aquarium-like room, you immediately tell us that the last time you were here some kids tried peeking under the curtain even though the signs say not to. And who said 3 year olds don’t remember anything? Before the main event begins, they show a short film on the history of the mermaids, complete with how they make the tails. Doh. And during the show you keep asking why the mermaids keep sticking underwater hoses into their mouths. Doh again! 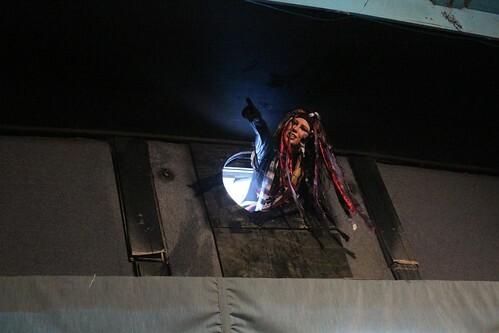 Near the end of show, you also remember that there is a screaming sea witch that pops out of the ceiling. But your sister did not remember and it scared the crap out of her. She jumped and screamed her little head off and grabbed on to you for dear life. I love that she seeks comfort from you and that you are there to protect her from the sea witches of the world. 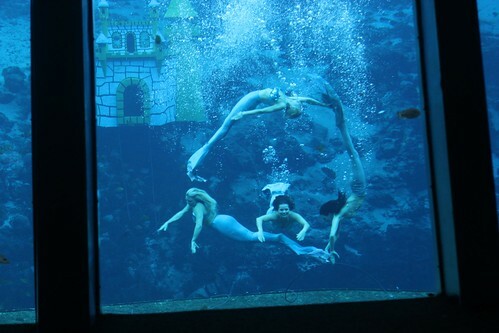 After the show, we walked around for bit posing as mermaids ourselves. By the end of the trip here, you put all the pieces together and figured out that these mermaids were not the real ones you were hoping for. But it didn’t seem to bother you one bit. 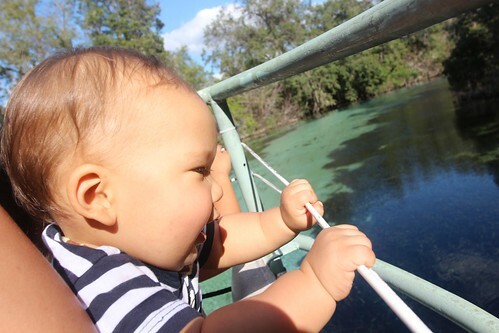 You had a blast at Weeki Wachee and we were over the moon to make all your birthday wishes come true today. When we finally got back to the Mish, it was finally cupcake time. This time we decided not to have the full menu from Island Event Planners. We got your Uncle Deets on the phone and we all sang happy birthday to our sweet 6 year old Ava. Hope you had the best day ever, Ava. We love you! 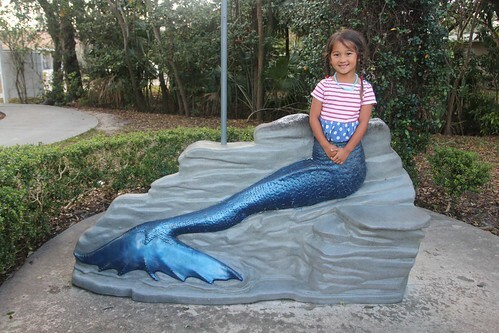 4 Responses to Day 163: Ava’s sixth birthday and a trip to Weeki Wachee. You have the most wonderful parents. One day you will know just how lucky you are. Happy Birthday cutie! Happy Birthday, Ava! 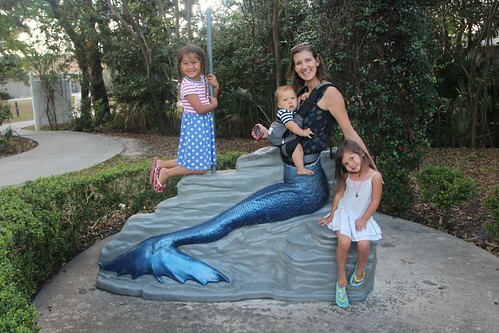 Such a lucky girl to spend the day not only with mermaids, but with your entire family out exploring the States in your Airstream! Wishing you many more experiences filled with wonder this year!